It is easy to forget about your hot water heater and heating system until they stop working. With a little preventative maintenance you can avoid impromptu cold showers and costly repair bills. 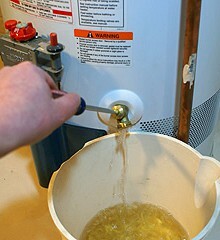 Make sure to add draining your hot water heater and servicing your HVAC system to you winter preparations. Draining your hot water heater once a year will help keep that blessed hot water flowing. Sediment from minerals in the water, or sand and grit coming in through the municipal water lines, can settle at the bottom of the tank and hinder its efficiency. It will cause cracking and popping noises during the heating process. Flushing the tank will help extend its life. Carbon monoxide leaks from a faulty furnace is dangerous. An estimated 500 people die and 15,000 are taken to the emergency room each year from exposure to this invisible gas. Symptoms are headaches, dizziness and nausea. Installing carbon monoxide and fire detectors in your home could help keep you and your family safe. You can keep your HVAC running efficiently by changing the air filters once a month. It will keep the unit from overheating. Dirty filters worsen air quality and exacerbate allergies and asthma symptoms. Pet dander can also accumulate in dirty filters and spread allergens throughout your home. One way you can help extend the life of your unit (and lower heating bills) is to install a programmable thermostat. It can help save you up to 10% on your energy bills. By setting your thermostat a few degrees lower in the winter and higher in the summer, you can see a noticeable difference in your bills. Check with your power company to see if there are any rebates available for upgrading your thermostat. Waking up to a cold house or stepping into a cold shower is no one’s idea of a great way to start to the day. Draining your hot water heater, getting your HVAC serviced, and changing that dirty air filter can help you avoid unwanted repair bills. The goal is to stay warm this winter and with a little preventative maintenance you can do just that. For more helpful DIY tips check out our blog on preparing your home for winter. Our expert staff is always on hand to help you with your DIY winterizing projects. From wet/dry vacuums and garden hoses to heaters, if you have any questions about what to choose, pricing or how-to’s, don’t hesitate to contact us. Stop by our store — we’re open seven days a week.